I shared some of the findings of my study into how young men develop as writers in their teen years. For this session, I focused on sharing the ways the young men participated in activities in schools, in out-of-school contexts, and online. Quite briefly, the young men used their experiences in these contexts as resources to help them achieve their developing writing purposes, preferences, and aspiring literate identities. 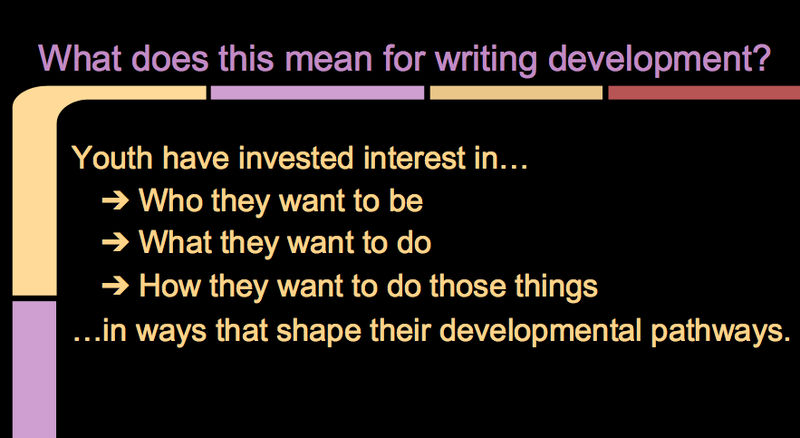 Their invested interests in who they wanted to be as writers, what they wanted to write, and how they wanted to go about doing those activities influenced the writing practices they took up, adapted, and resisted. The young men habitually reminisced on past moments during which these desires had crystalized, as well as anticipated futures in which they’d have to negotiate these desires in their future social contexts. The young men used reminiscence and anticipation in making decisions about their writing—the whats, hows, whens and wheres. In these ways, the young men did not simply follow pre-designated pathways, learning in lock-step fashion, whether in or outside of school. To understand their development as writers, I needed to understand this interest-driven work, as the young men forged their developmental pathways accordingly. On the backchannel near the end of the session, we had just began to discuss pedagogies and approaches that could be taken up in educational contexts to respond to this expanded notion of youths’ interest-driven learning. Our discussion was very truncated due to the time, and so please feel free, and please do, add your ideas in the comments of this post!